A line from Kurskiy Vokzal (i.e. Kursk railway terminal) to Rogozhskaya Zastava stretched along Kostomarovskiy Bridge, Andronievskaya Ploshchad and Shkolnaya Street. The line was planned for construction in 1940, but the war delayed it until 1952. 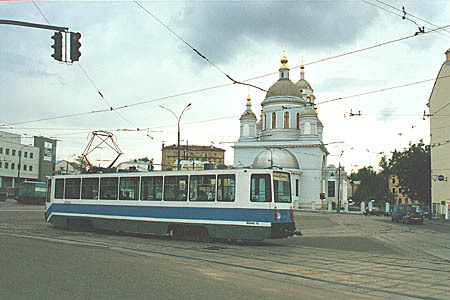 The line became a replacement for a line in nearby Uliyanovskaya and Tulinskaya streets, where tram service was replaced with trolleybuses. 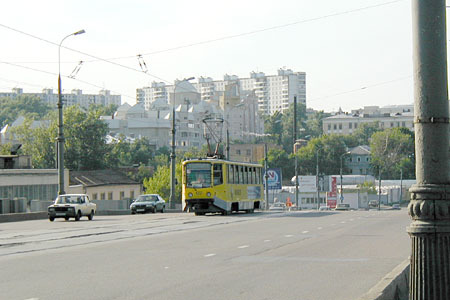 Until 1963 this line crossed Sadovoye Koltso and joined with the Boulevard line, but this crossing and the line in Vorontsovo Pole Street fell victims of the next anti-tram campain. Another part of this line in Shkolnaya Street was closed in 1980. The remaining line from a loop beside Kurskiy Vokzal to Andronievskaya Ploshchad still survives and is now served by routes 20 and 24. 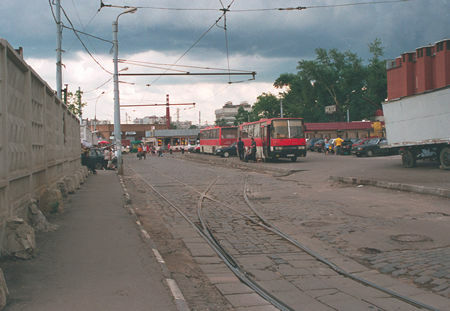 Kurskiy Vokzal tram terminus - a simple two-track loop pressed between a concrete fence and a parking lot. But, frankly speaking, this terminus has a very convenient Metro transfer, the Metro entrance located just a few dozen steps from this point. 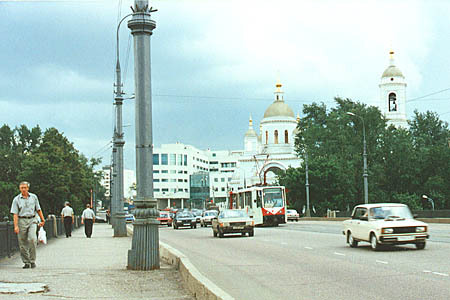 Verkhnyaya Syromyatnicheskaya Street downgrades to the Yauza River quay. 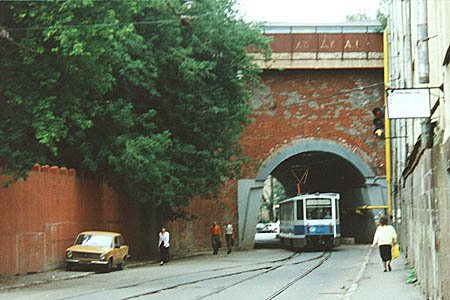 Another line branches to Syromyatnicheskiy Proyezd, passing through a tunnel under the railway embankment, with an interlaced track section in this tunnel. Route 24 diverges to this line, leaving the next part with route 20 only (not a frequent one). Kostomarovskiy Bridge over Yauza River. Old and new: the church of XVIII century faces a bank of 1990's. Another view from Kostomarovskiy Bridge (apparently from the same point as the previous photo) - towards the city centre. Those ugly square blocks, typical for Moscow construction of 1980's, in no way can fit into landscape, I suppose. In Andronievskaya Ploshchad (quite a large square with high traffic) the line meets another one, from Volochaevskaya Street to Bolshaya Andronievskaya Street. 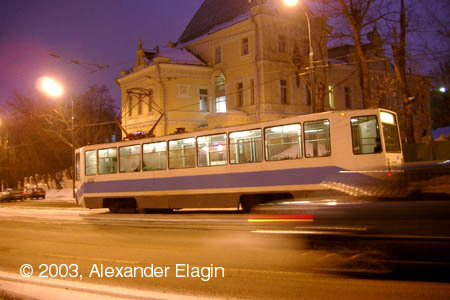 A thunderstorm is gathering, while this tram waits at the traffic-light en route to Bolshaya Andronievskaya Street. The line to Kostomarovskiy Bridge can be seen in the right part of this photo.